Last Sunday, we went to Federation Square to visit our feathered friends. A week before, we went there with my cousin, Cheryl who was on a 10-days trip in Melbourne. Iris had a great time then, and she sacrificed two yummy croissants to the birds. Sensing that the experience was not adequate, we made a pack to go there again, just the two of us. Daddy didn’t go cycling that day, and he didn’t come as well as he had a split headache. Poor daddy! We took a train from Oak Park train station and stopped to purchase a loaf of bread at Coles, Melbourne Central. Although a dear friend suggested to purchase the bread at Coles adjacent to Flinders Street Station (which is just across Federation Square), we purposely hopped off the train at Melbourne Central as I thought Iris would appreciate a tram ride from Melbourne Central to Federation Square. Well, the tram didn’t arrive, apparently due to some sort of disruptions. We waited for about 10 minutes when I saw on the display that almost every tram line that runs along Swanston Street was interrupted that day. So we walked….. And that girl is a good walker, as steady as a horse, though occasional complaints came from her about the distance and more questions asking ‘are we there yet?’ Mama responded, ‘just in front, do you the traffic light? After the traffic light, ok?’ Twice. Later that day, she said to me, ‘lucky I wore my NB shoes, mom. They are good for walking!’ Couldn’t agree more, pumpkin, couldn’t agree more! As we approached Federation Square, I got the reason for the tram service disruptions. 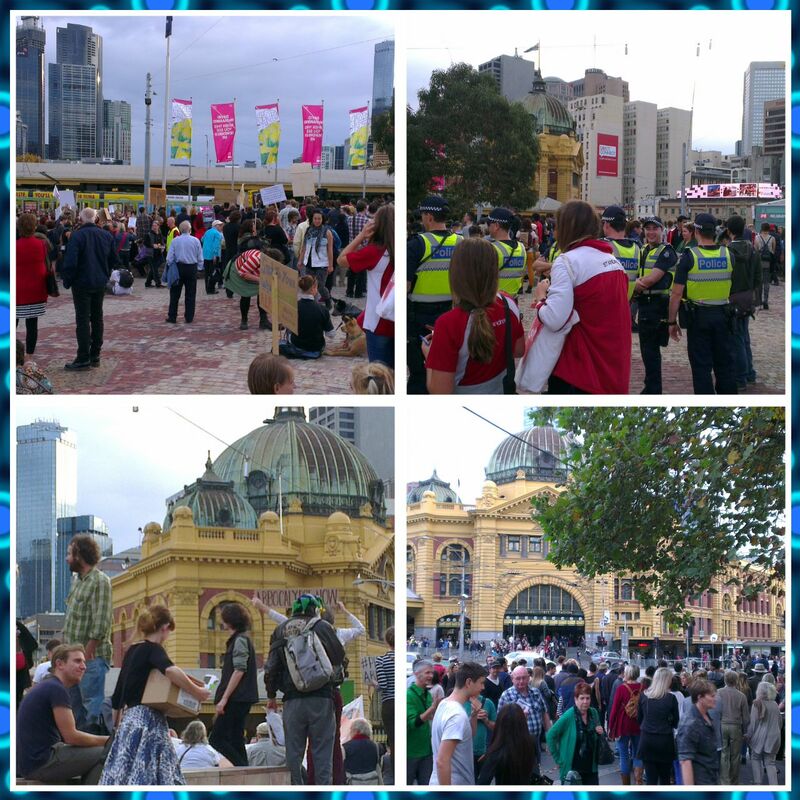 There was a rally taking place at Federation Square; the center of the square was packed with people protesting the budget cut imposed by the current government and in fact, it was organized all over Australia involving about 10,000 protesters. Well, what was I thinking when I saw the crowd? At first I hesitated as I fear that people can be violent during rallies. Alcohol and rallies do not mix well, and yes, I assumed that people may get drunk in such events. I was proven wrong when it was indeed a peaceful protest. The event was attended by families and many brought young children with them. The police were everywhere and they were observing, and not to extent to obstruct the rally. By the time I decided to proceed to the Yarra riverbank, Iris announced that she lost her Myki card. Alamak.… Well, it is another story to tell. Here’s some images from the rally. Until the next entry, sayonara minna san!